Here are the Results from the Street-O held in Clapton on Tuesday 15 September 2015. I hope everyone enjoyed the visit northeastwards and liked the mix of streets and rough pasture. As well as Clapton, the area included Walthamstow Marshes, Stoke Newington and Stamford Hill. 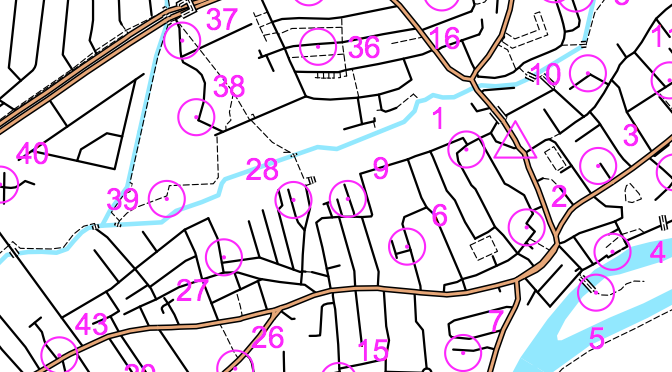 I used OOMap to create the map with an unusually high number of controls (47) and a small scale, to ensure that even the fastest would have to make choices about which part of the map to ignore during their run – the maximum theoretical score was 1010. Apologies that the postbox at No. 22 was missing, I have given points to everyone who wrote in words to this effect. One runner was unlucky enough to run into the Waterworks Nature Reserve (immediately south of No. 41) and then got trapped in the gathering gloom as the only gate was locked. Thankfully he was able to eventually climb out! Many people ran through Springfield Park during their race (the small one on a hill) which we may look at including in a Park Race in the future. Thanks to Suki for running the start and collating the results, to Andy, Simon, Catherine and Ben for marking, my team at work for correcting a couple of descriptions, and the Princess of Wales Lea Bridge for hosting us. Lost property: One ankle brace. Please contact to claim. I will also aim to bring this, and unclaimed maps, to the next race which is at London Bridge on 13 October. We aim to keep these events “bare bones” by making them cheap to enter and easy to organise, so please make your organiser’s life easier by “entering” in advance on Facebook and bringing your SI card if you have one.